As soon as I saw the "Just My Type" stamp set, I knew it would be perfect to use for my mom's birthday card. She actually still has a working typewriter! 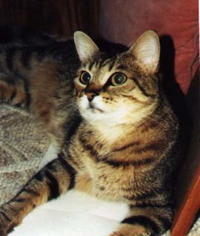 Nine years ago today, our dear sweet Maggie went to kitty heaven. Bill & I had adopted her from the Humane Society on September 1, 1986. She was about a year old at the time and was 17 1/2 when she died. She had broken a bone in her leg in November 2002. To this day, we have no idea how she did it but the vet had said it was probably brittle bones caused by age and her thyroid medication. She never fully recovered and suffered what the vet believed was a stroke on the morning of February 22, 2003. A movie is currently in the works and set to be released in June. I definitely want to see it although I wonder if it will be as good. I may buy the cast recording too! Too funny! If you've never seen the movie, Ferris Bueller, I'm sure the commercial wouldn't make any sense. It's one of my favorite movies though, so I think it's hysterical.